This 13-story apartment building was designed by Pickering and Walker in 1912 and closely resembles the larger 829 Park Avenue apartment building that had been erected the year before. It originally had 12 duplex units and according to a July 4, 1993 article in The New York Times by Christopher Gray each has "a library, living room and dining room across the front, a kitchen and three servants' rooms in the middle and four master medrooms in the rear in the upper part of the duplex." "Interior photographs show a 55-foot sweep from the dining room through to the library, and kitchens with dinosaur-sized appliances," the article continued, added, however, that "in 1940 the shareholders gave the building back to the principal lender, the Dry Dock Savings Bank, and the building was emptied." "Dry Dock," the article continued, "brought in Edgar Ellinger, who had just drastically cut down the large apartments in the bank's Alwyn Court apartments on 58th Street and Seventh Avenue, and Louis S. Weeks, the bank's consulting architect. They developed a plan to make 38 two-to four-room apartments in place of the original 23. 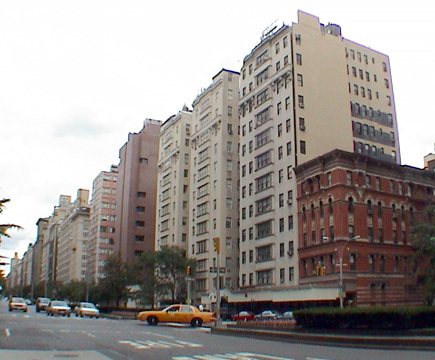 They introduced push-button elevators, kitchenettes, glass-block partitions and an outside servants' bathroom on each public hallway....In 1930, 70 percent of the tenants at 823 were in the Social Register....But in 1950, after reconstruction, only 10 percent of 823 Park Avenue's tenants were in the Social Register. According to article by Steve Cutler in The Real Deal the building "slipped into foreclosure once again in the early 1990s for failure to pay real estate taxes." "The Manocherian Brothers," the article continued, "purchased the property at a city auction for $4,175 million in 1994" and ten years later sold it Elliott Joseph of the Property Market Group for about $61 million. Mr. Joseph commissioned architect Barry Rice to convert the building to 12 condominium apartments. Mr. Elliot's company asked the Landmarks Preservation Commission for permission to add a floor to the building as well as to create a 20-foot-square room on every floor at the rear of the building. The commission denied the request for an additional floor, but approved the plan for the extension at the rear. An 8-bedroom, maisonette duplex unit in the building that was subsequently offered for almost $20 million had two fireplaces and Blue Eyes marble in the kitchens and non-porous CaesarStone quartz. An article by Max Abelson in the September 18, 2008 edition of The New York Observer noted that Ray Iwanowski paid about $13,500,000 for a full-floor apartment with 10-foot-high ceilings and two fireplaces at 823 Park Avenue.